A delicious low Nacholess nacho recipe! Welcome 2011! With the start of any New Year, we have the opportunity to check in with ourselves to see what area of our life needs a little “fine tuning”. Do you crave more balance and time with your family? Do you want to finally (and I mean finally!) take off the weight that has been bugging you for months and/or years? Or…do you simply want to feel more energetic, livelier and a more active participant of life? I wish you a year filled with joy, laughter, health and feeling alive! So…what’s the deal with soy? Is this humble bean a healthy food option or can it be harmful to your health? Winter seems to be the hardest time to maintain our fitness and nutrition regimen. What can we do to ensure we don’t fall too far off track? I have had great success using this supplement in my clinic. There are 4 key ingredients –(glucomannan, svetol, 5-HTP and chromium). that help weight loss seekers feel full, balances blood sugar, breaks cravings and end the need to overeat. Available in capsules, or in refreshing, convenient, easy-to-drink, natural pink grapefruit flavor stick packs. As a “cream junkie”, I love when I find a great new and natural cream. My latest favorite is Ella’s botanicals Lemon Meringue lotion – it is truly amazing! 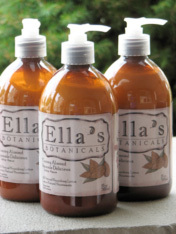 Proudly Canadian, Ella has been making natural, handmade products for over 10 years. Ingredients are carefully chosen and blended, balancing therapeutic value with fun and enjoyment, always keeping in mind the impact we have on our planet. For more information, please visit www.ellasbotanicals.com. Looking for some low calorie faux pasta? Try Shirataki noodles! These low carbohydrate, translucent and gluten free Japanese noodles can be found in most grocery stores. Although they do not have much flavor on their own, they absorb other ingredients well such as tomatoes or soy sauce. Rinse well prior to use. For more information, please visit www.house-foods.com. The fifth edition is here! If you are looking for one comprehensive book to be your nutrition “bible” than this book is it. 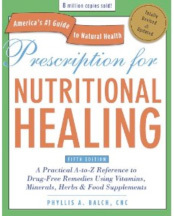 Prescriptions for nutritional healing is written by a medical doctor and a certified nutritional consultant and is a comprehensive guide to nutritional, herbal, and complementary therapies addressing over 300 health conditions. Arranged in alphabetical order, it's a useful ready-reference tool and is a “must have” for every household. Preheat oven to 375°F. In a large bowl, butter or oil and sugar. Stir in applesauce, eggs, orange juice and vanilla. In a second large bowl, whisk together flour, baking powder and salt. Stir flour mixture into butter-egg mixture until just combined. Gently stir in blueberries. Spoon batter into muffin cups and bake until a toothpick inserted in the center of a muffin comes out clean, about 30 minutes. Heat a small skillet over medium heat. Add oil, garlic, edamame and shirataki noodles and heat for 1-2 minutes. Add sun-dried tomatoes and red-pepper flakes (optional). Cook, stirring occasionally, until fragrant, 20 to 30 seconds. Remove from heat. Combine with goat’s cheese and dill. Season with salt and pepper, stir to combine. Let stand to thicken approximately 5 minutes. Please note: If shirataki noodles do not appeal to you, substitute with cooked kamut or spelt pasta. If wanting to go “low carb”, peel zucchini into spirals, sautee and use as noodles. In university, my “go to” appetizer was a big plate of nachos! Dipped with guacamole and enjoyed with a cold beer – there was truly nothing like it. Unfortunately, most nacho platters are filled with saturated fats, calories and carbohydrates. So…in order to enjoy my favorite appetizer, I have come up with a low carb nacho dish that truly delivers the same taste. Congratulations to Barb who lost 68 pounds at Shulman Weight Loss. Bravo – you truly have transformed!